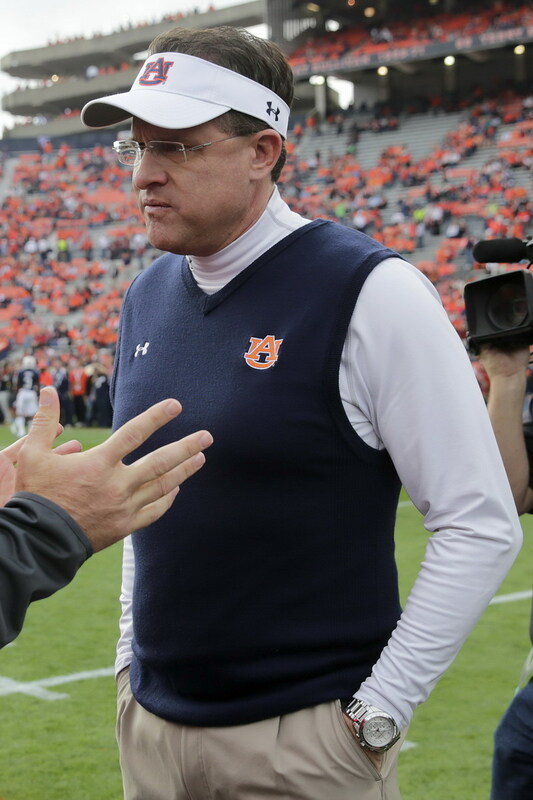 As a lifelong Alabama football fan and occasional celebrity watch-spotter, I knew that I would face the question, “What kind of watch does Nick Saban wear?” A celebrity coach, in nationally-televised games, standing on the sidelines, often in a short-sleeve shirt, with his arms crossed across his chest, wearing a large watch. Yes, I faced the question several times over the years, but had resisted the urge to find the answer. Having spent five years tracking Barack Obama’s watch, a few weeks identifying John Glenn’s stopwatch, days studying photos of Mick Jagger’s vintage Heuers, and a few hours examining Bo Derek’s wrist, the last thing I wanted was another celebrity watch to follow — more hours checking photos on the Getty Images and Associated Press websites. 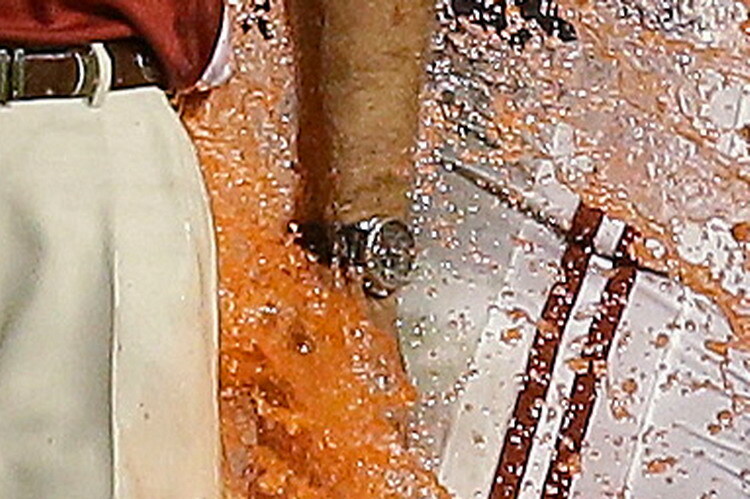 My attitude toward Nick Saban’s watch began to change, however, in late October 2013, as the BAMA football team demolished opponents Arkansas (52-0) and Tennessee (45-10). As much as I wanted to avoid paying attention to Nick Saban’s watch, I found myself focusing less on the play-by-play of the games, and more on Saban pacing the sidelines. Yes, the watch is big. It looks like a chronograph. But not any brand or model that I recognize. 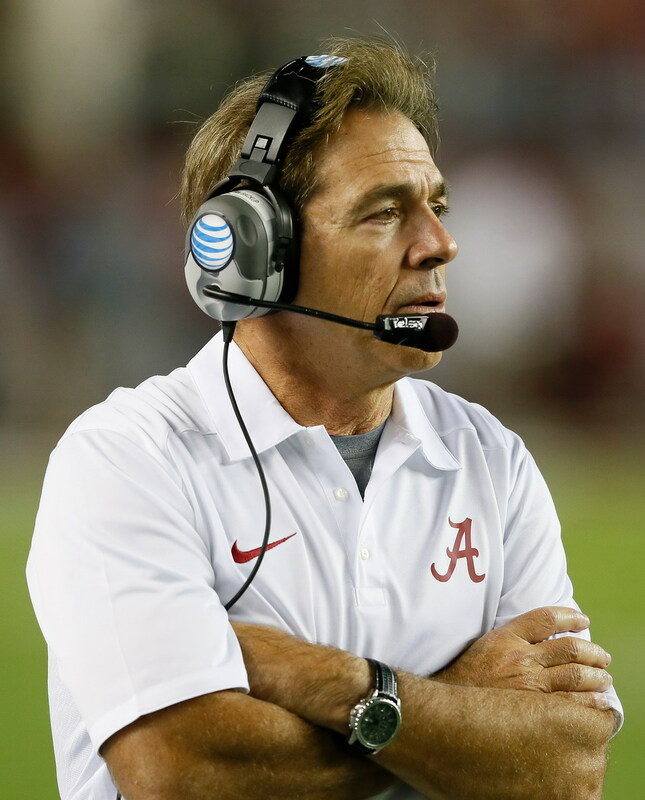 By way of background – especially for the readers who are not college football enthusiasts – Nick Saban is the most successful college football in recent history, having won four of the last 10 national championships and three in the last four years. He is the most highly paid coach in college football, earning over $5 million from the University of Alabama in 2013, with some additional spending money coming from endorsements and promotions. Yes, this is a man who can buy any watch that he wants. 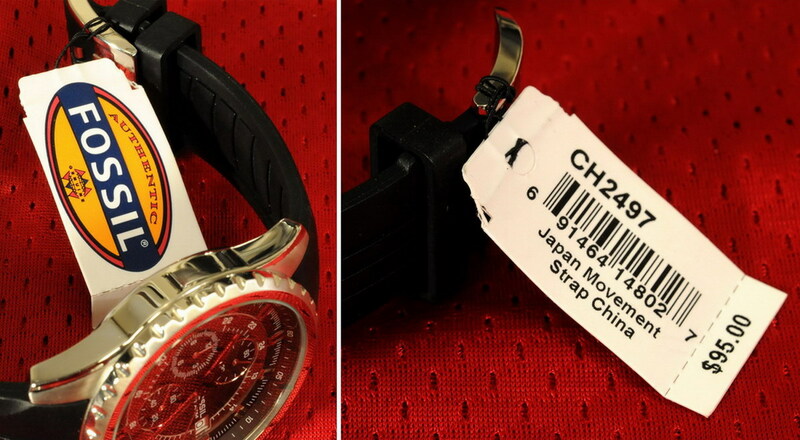 Before beginning the forensic work to identify Nick Saban’s watch, it is worth asking about the type of watch that we would expect Nick Saban to wear. Given the customary photos of Nick Saban lifting the crystal Coaches’ Trophy after winning a BCS national championship, the obvious watch would be one with a lot of diamonds, like theHublot (shown below). 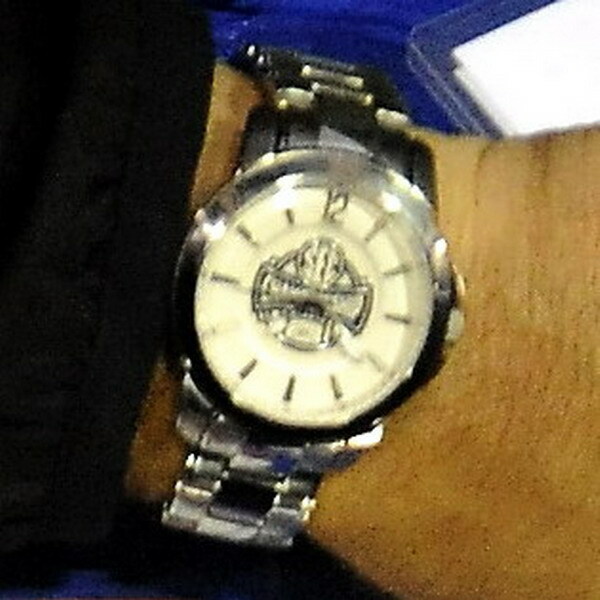 Yes, Nick Saban could have spent a year’s salary to buy this watch, but it does not seem to be his style. 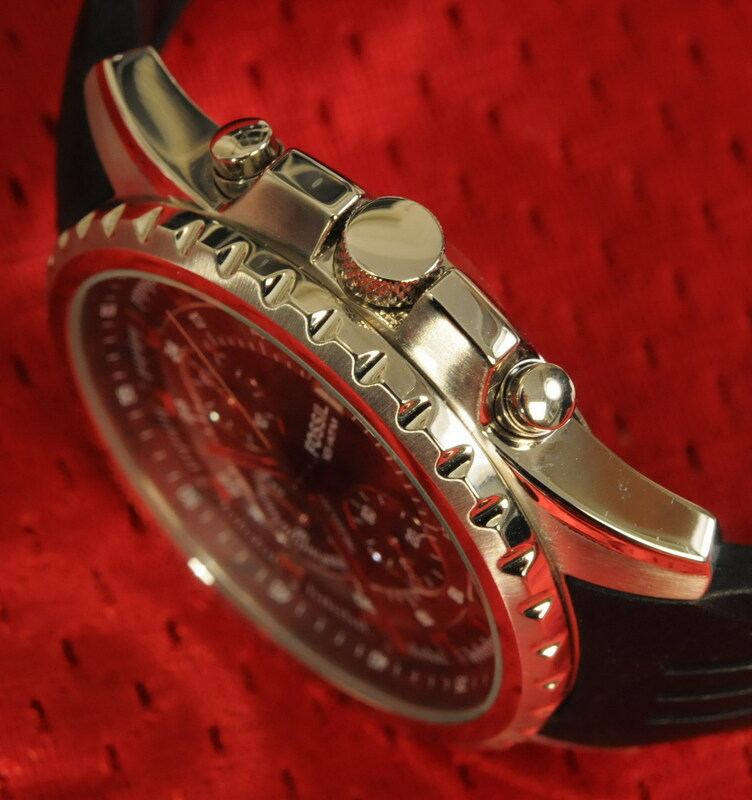 A review of college football coaches shows that their watches represent the full range of styles and budgets, from $50 plastic sport watches to high-end fashion watches. 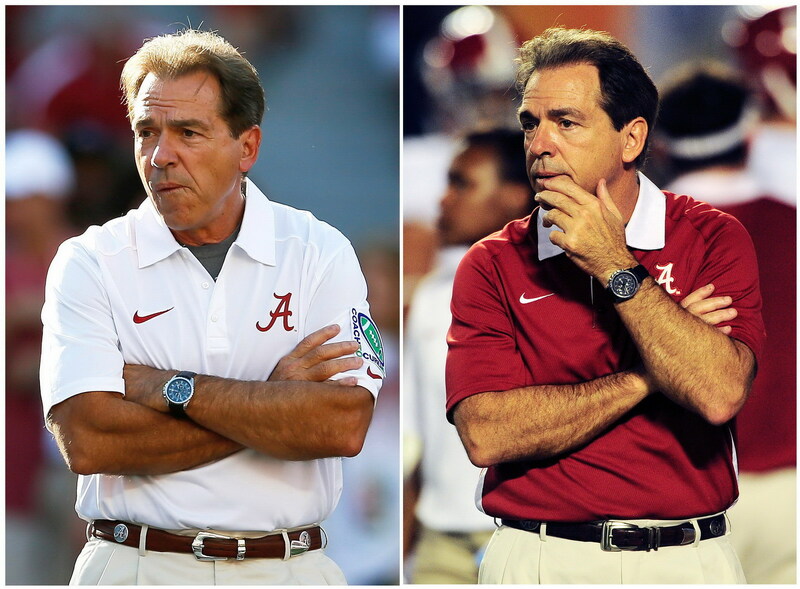 A survey of a few of these coaches watches helps us put Saban’s watch into its proper perspective. 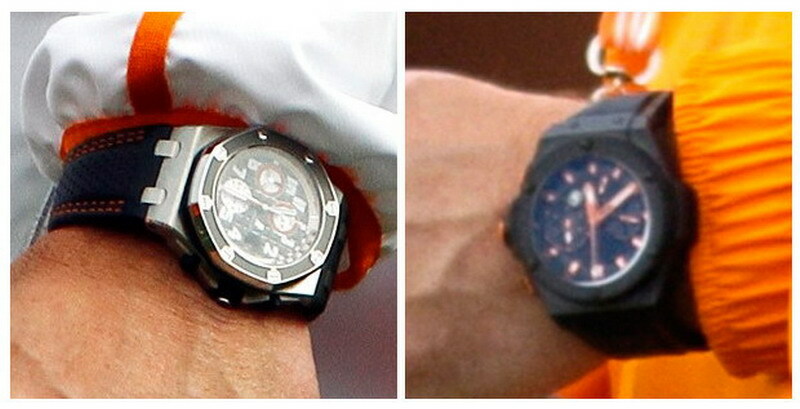 At the high end of the range, we see Butch Jones, the first-year coach of the University of Tennessee, wearing an Audemars Piguet Royal Oak chronograph (below left) and another fancy looking chronograph (that seems to be a Hublot or another AP). 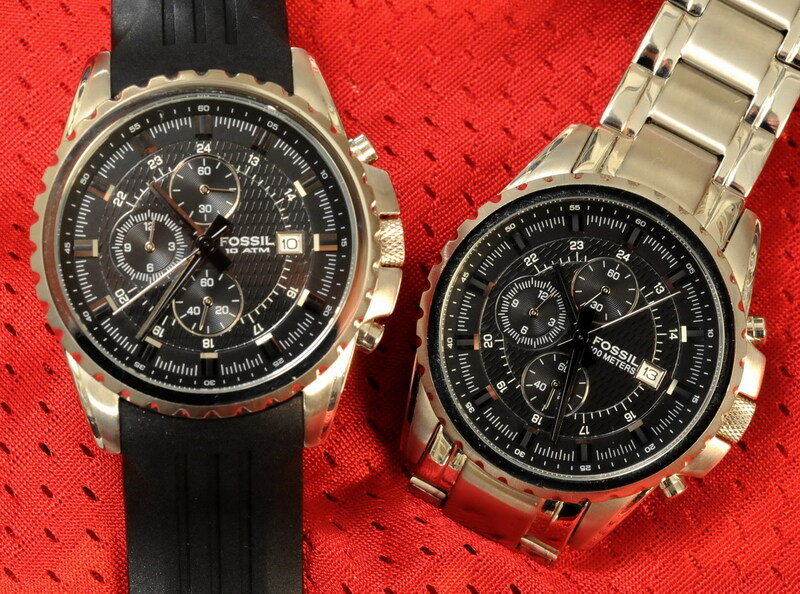 The ballpark estimate for either one of these chronographs — at least $10,000. 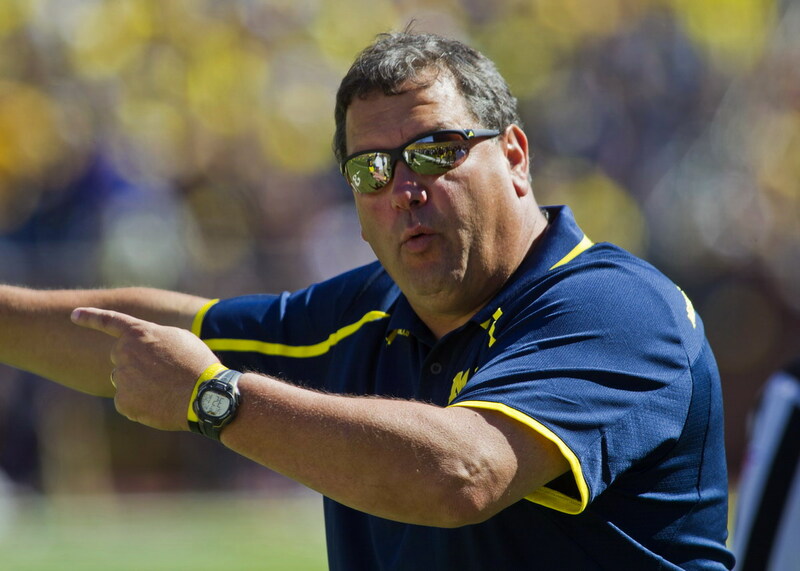 At the less expensive end of the spectrum, Michigan coach Brady Hoke wears a Timex Ironman that retails for around $50. Well, at least this one is a step above the entry-level Ironman watches, which sell for around $30. 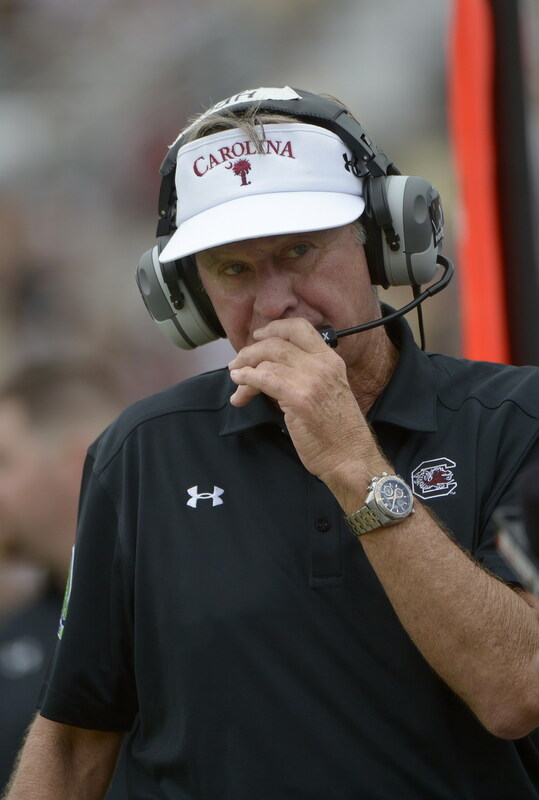 Somewhere in between, we have South Carolina coach Steve Spurrier (below left), wearing a Citizen “Grand Complication” chronograph. This chronograph, in titanium and rose gold, includes the usual chronograph functions, and also keeps Spurrier informed the day, date and month, and even the year in the leap year cycle. That’s lots of information for $1,200, a complicated watch for a complicated coach. We should also consider the possibility that instead of buying a watch, Nick Saban might wear one of the commemorative watches that he would have received for a bowl game appearance. 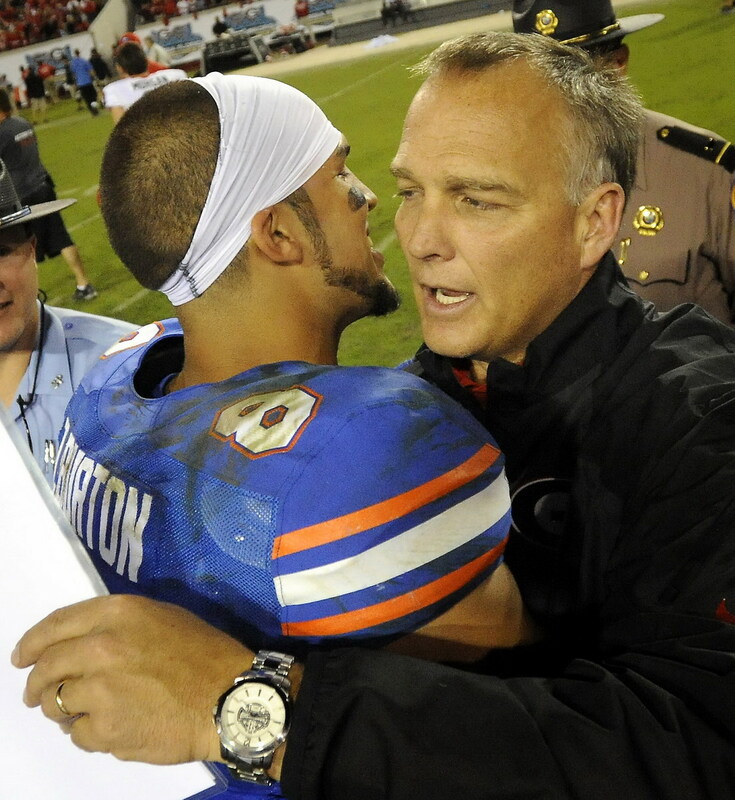 Mark Richt (below left) didn’t win the SEC Championship game in 2012, but at least he left Atlanta with a watch. LSU coach Les Miles (above right) is known to have had some “clock management” issues in critical game situations, and now we understand why. 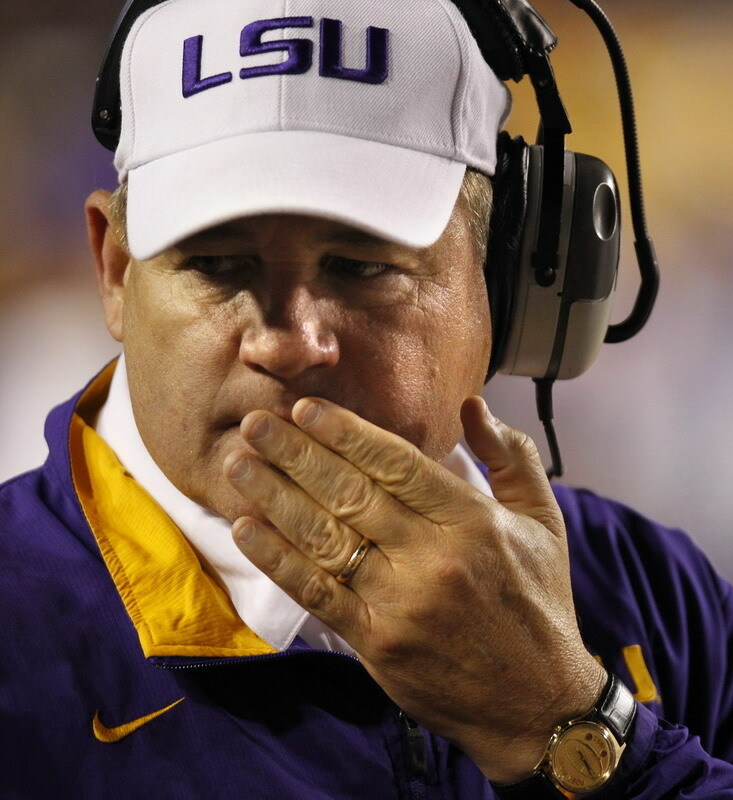 Of the leading coaches that we checked, Les Miles is the only one who wears a simple time-of-day watch, rather than a chronograph. 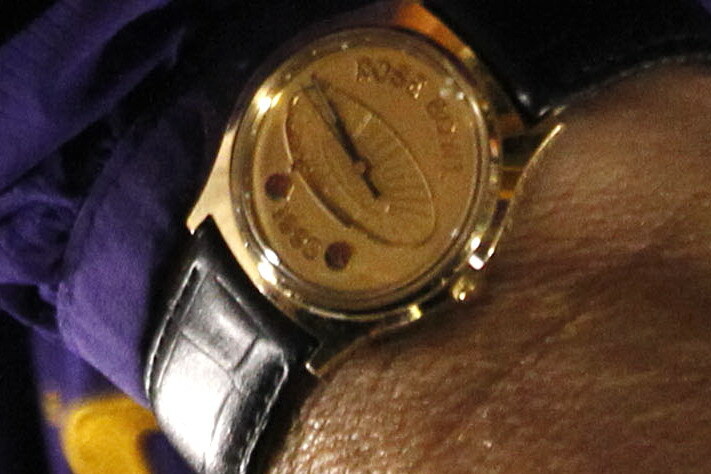 In fact, Les Miles wears the watch that he received for going to the Rose Bowl as an assistant coach at Michigan, in the 1980s. We’ve got to wonder whether wearing this watch could have fueled the rumors – in 2007 and 2011 – that Miles would be returning to Michigan. Come on Les, go get yourself a new watch! 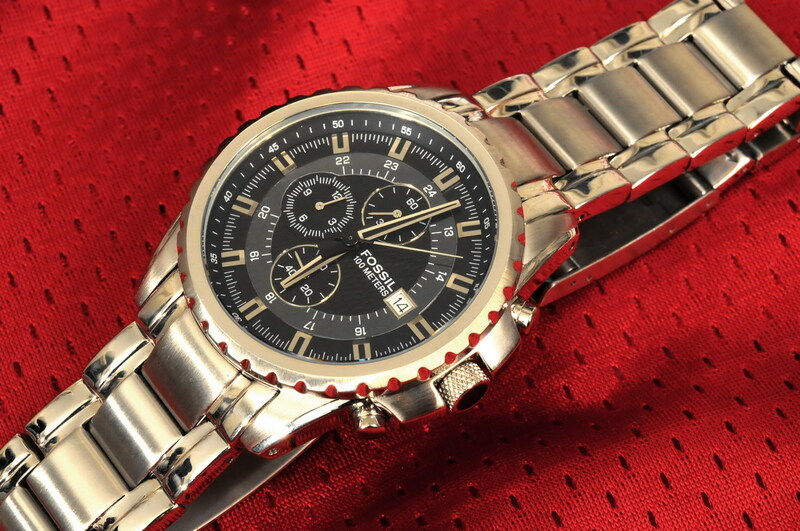 Nick Saban’s watch is a Fossil chronograph, Reference CH 2497, which retails for $95. 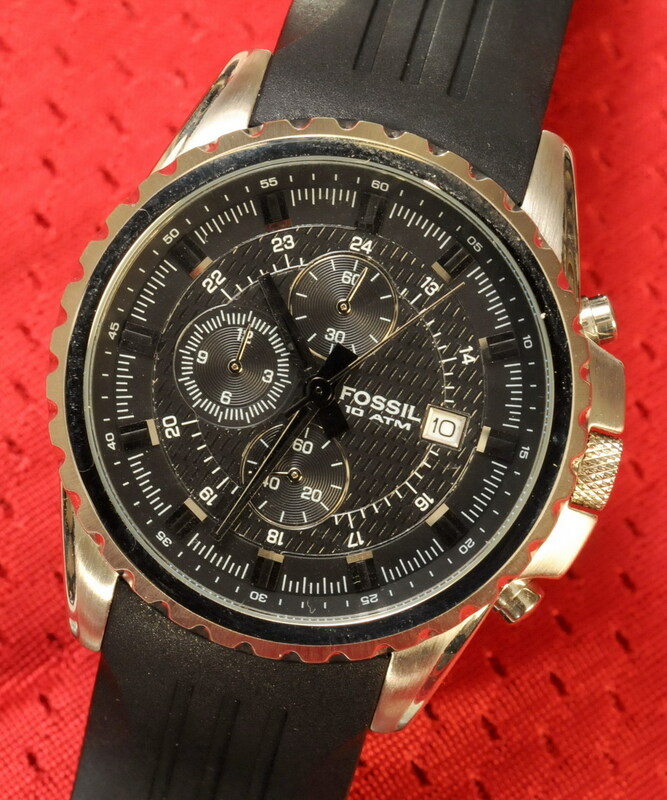 The Fossil Reference CH 2497 is a three-register chronograph, with 12 hour chronograph indication. The three registers are for “running seconds” at 6 o’clock, chronograph minutes at 12 o’clock, and chronograph hours at 9 o’clock. The inner bezel, between the surface of the dial and the crystal, is marked for minutes. Applied steel markers show the hours, with the “military” 13 to 24 hours printed just inside these markers. 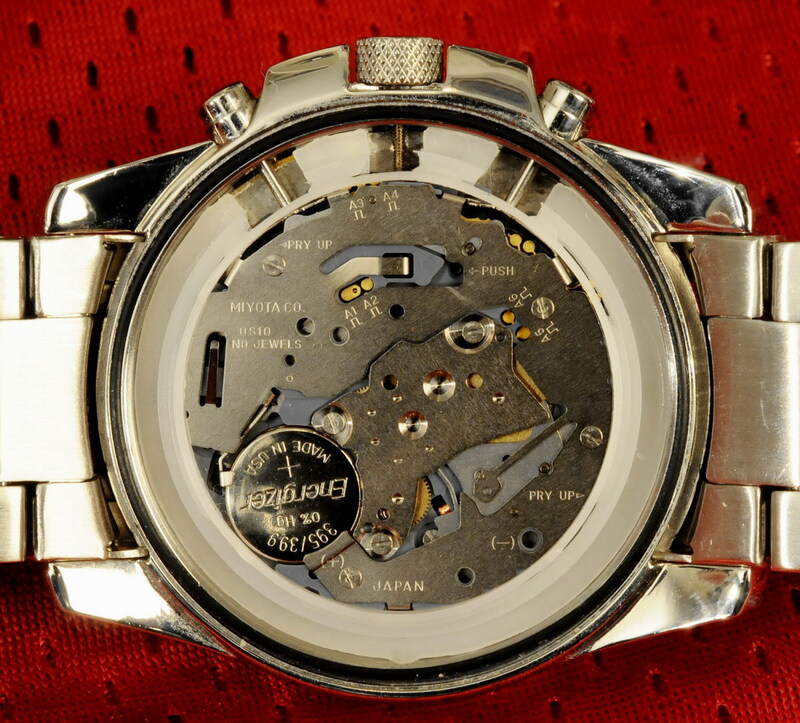 The chronograph is operated by two pushers, above and below the crown. The pusher above the crown starts and stops the chronograph; the pusher below the crown resets the chronograph to zero. 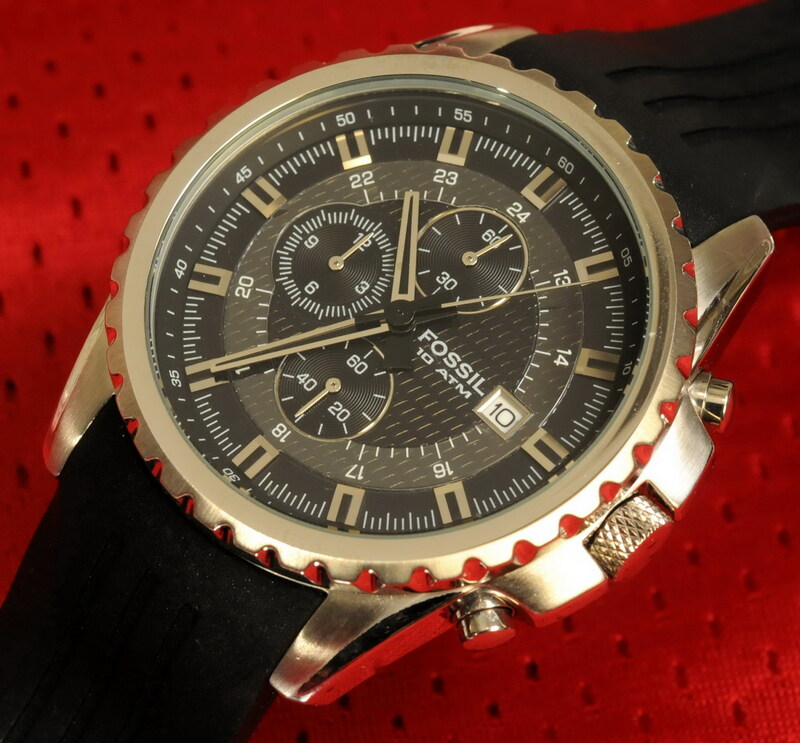 The case of the Fossil CH 2497 is stainless steel, with a knurled, fixed (non-rotating) bezel. The case measures measures 42 millimeters across the dial, 11.3 mm from the back of the case to the top of the crystal and 49.2 mm from top of the top lug to the bottom of the bottom lug.This chronograph is fitted with a rubber strap, with the ends of the strap curved to fit snugly against the edge of the case. The movement is Miyota OS10 movement, made in Japan, and having no jewels. Perhaps the most distinctive feature of the Fossil Reference CH 2497 is the texture of the dial. The entire dial is black, but from certain angles the track with the numerals 13 through 24 appears to be a charcoal or dark gray. Neither the dial nor the hands have luminous material. 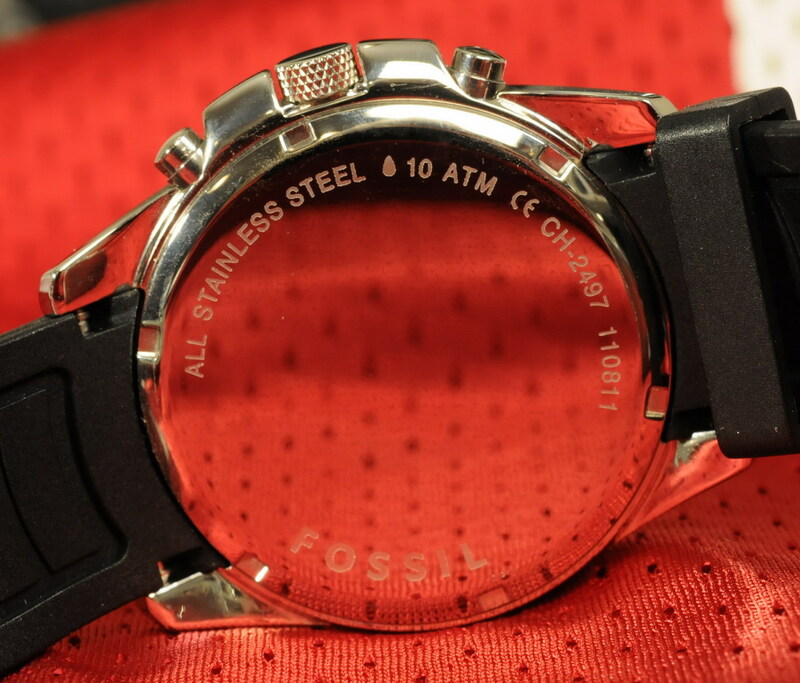 The Fossil Reference CH 2497 is has a water resistance rating of 10 atmospheres, which is equivalent to 100 meters. While we wouldn’t expect this watch to actually survive a dive of 100 meters, this level of water resistance might be ideal for the gentleman who should expect the occasional shower under the cooler full of Gatorade. 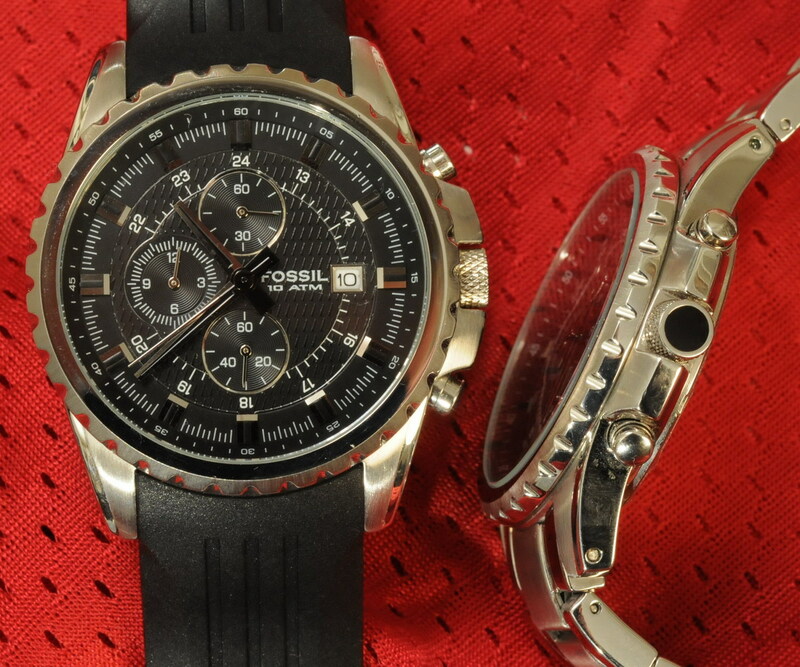 The Fossil Reference CH 2497 chronograph is made in China, retails for $95, and comes with an 11-year warranty. 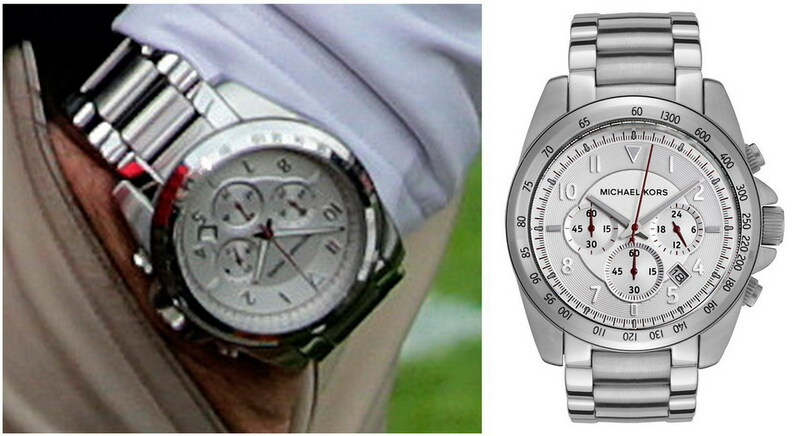 Fossil produced another model that appears to be almost identical to the Reference CH 2497, worn by Nick Saban. 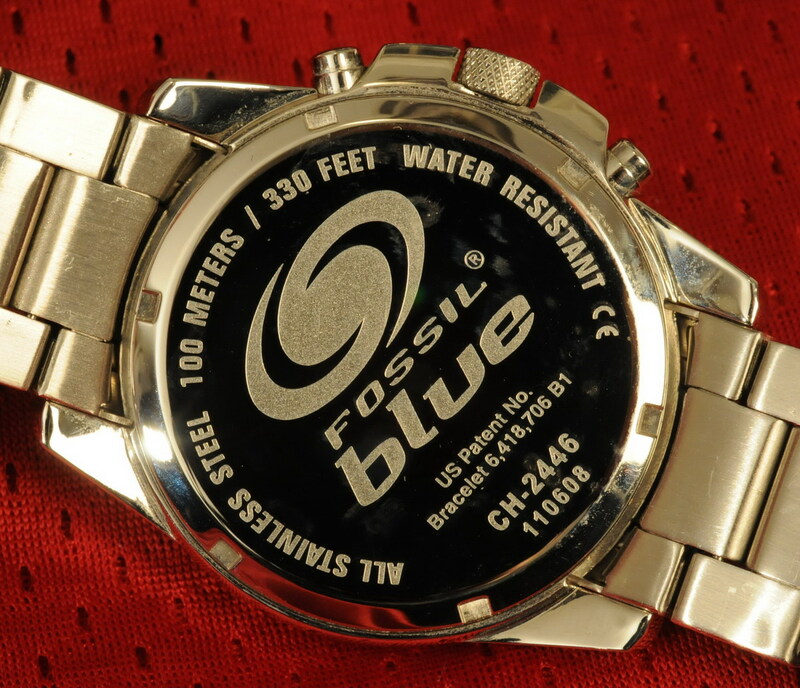 In addition to different markings for the model and water resistance, the case-back of the CH 2446 is marked “Fossil Blue” (“Blue” being a line of watches marketed by Fossil). 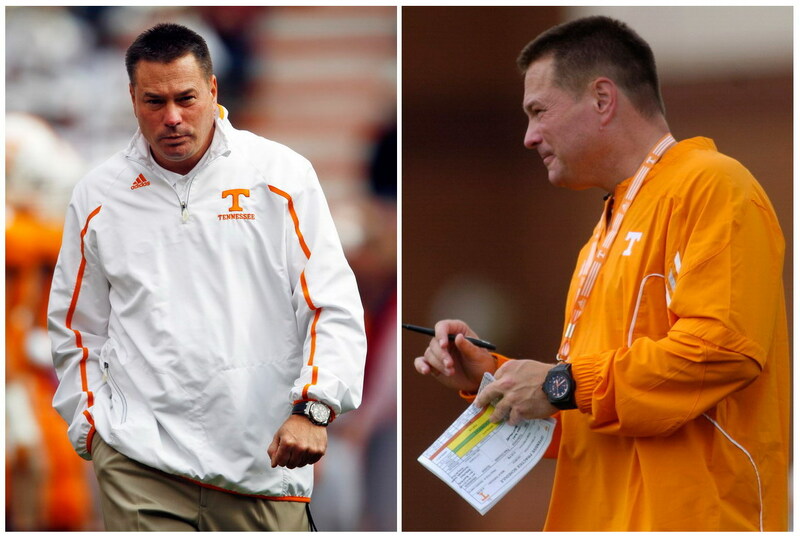 From a loyalist: I want him recruiting players, watching film and developing game plans. Any time spent caring about his watch wold only be a distraction. 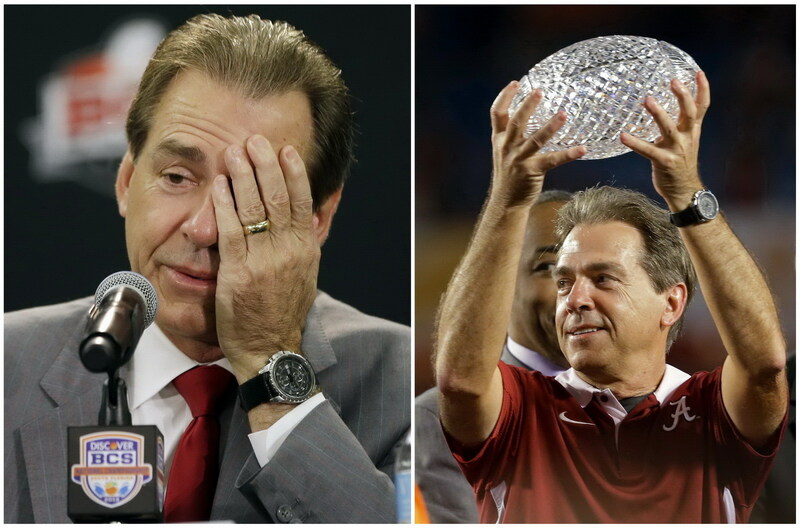 The Fossil is a perfect fit for Nick Saban. From a lover: God, he looks great in that watch. Where can I buy one? From a hater: There is nothing that touches that man’s body that is not the best of the best. He has million dollar homes and rides in the best planes and cars. It is unthinkable that he desecrates his body by allowing it to come into contact with these cheap pieces of metal and rubber. There’s something wrong here; the NCAA should launch an investigation. From a fan: Of course he wears a simple, inexpensive watch. Fancy watches are not part of the process. Nick Saban is known for his single-minded focus on the performance of his players and his teams and — over the years — has developed a process that he believes will achieve the best results. The process involves finding the best high school players, recruiting them to come to Alabama, building them into the best football players they can be, focusing on the next practice or game, and preparing student-athletes for the NFL (or, for most of his players, for life after football). Nick Saban knows that if he follows the process, then the results will take care of themselves. Nick Saban refers to forces in the world that might keep him from following the process as “external factors.” He eats the exact same meals most days, to save the time that selecting different foods might require. Recently asked about AJ McCarron being on the cover of Sports Illustrated, Saban responded that he has no time for magazines, newspapers or TV, his only use of the media being a quick check of the Weather Channel, to determine whether practice will be outdoors or indoors. Clearly, taking any time to research, select, purchase or even care about a fancy watch would be an “external factor.” There are times when the “process” requires that Nick Saban know what time it is. 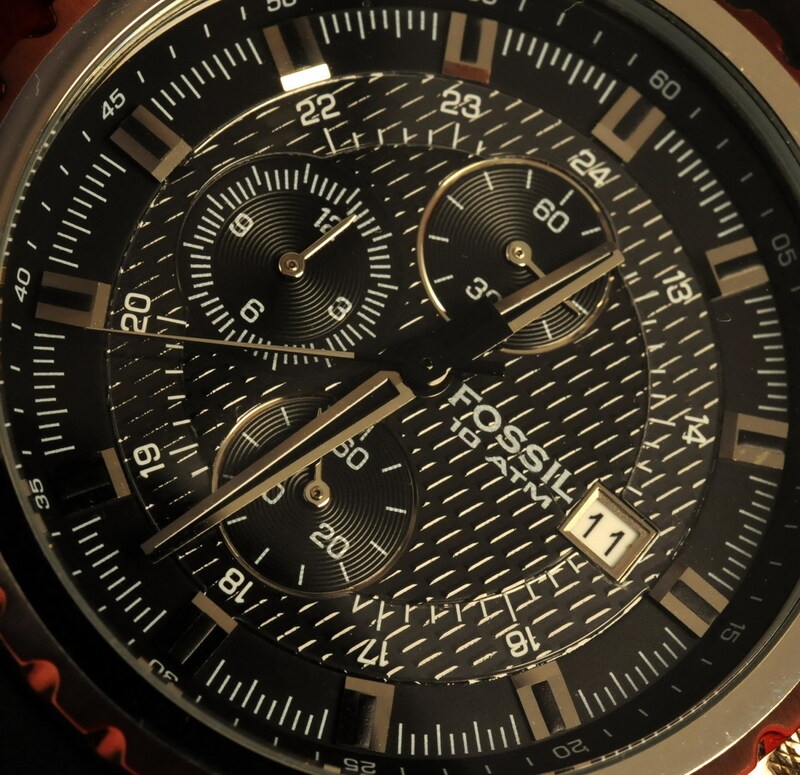 This $95 Fossil chronograph supports the process, without becoming an “external factor”. Nick Saban has been studied and analyzed by lots of folks — from competing coaches, to business school professors, to psychologists. Some of his rivals think of him as an evil genius, seeking to characterize what he is doing as being wrong. Others wonder how a man can function, driven by such singular goals and commitment to “the process”. One of the keys to understanding Nick Saban is understanding that while he controls the process, there are factors in his life that he cannot control. Whether questioned about an off-the-field incident involving a player, or an aspect of the team’s schedule, Saban is likely to reply, “It is what it is.” Yes, there are aspects of his life that he cannot control, and perhaps one of the keys to Nick Saban’s success is in knowing which elements he can change and which are beyond his control. So too, with his $95 Fossil watch, we can only conclude that it is what it is. 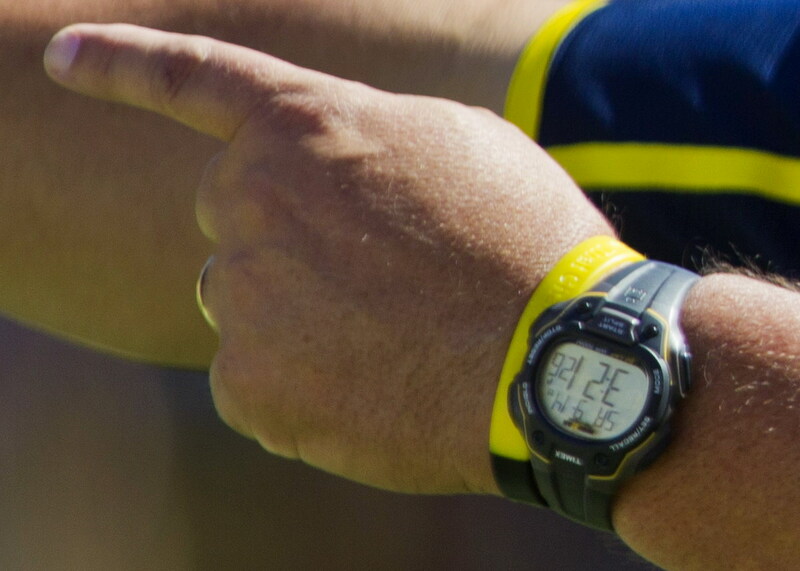 It’s a $95 watch being worn by the greatest football coach of our era. 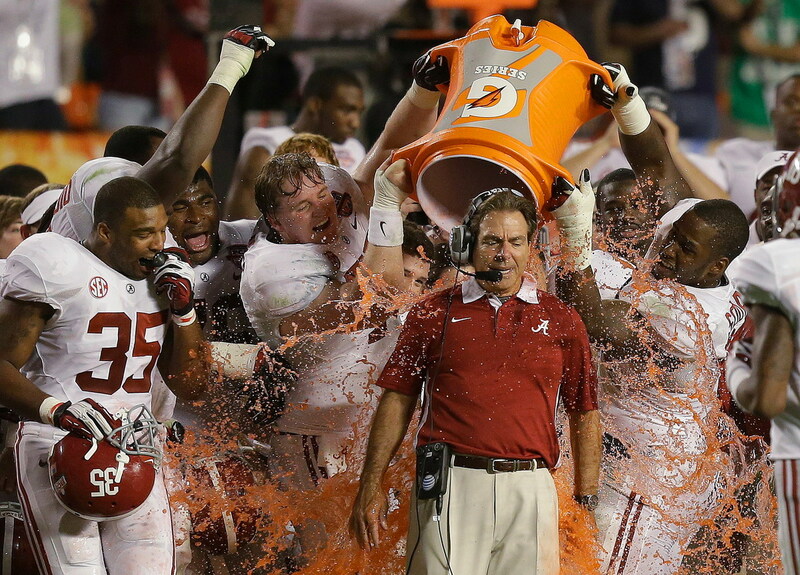 Indeed, Nick Saban is the same as Bear Bryant, Gene Stallings, Wallace Wade and Frank Thomas. He’s got the national championships to prove it; he’s got his nine-foot bronze statue at Bryant-Denny Stadium. 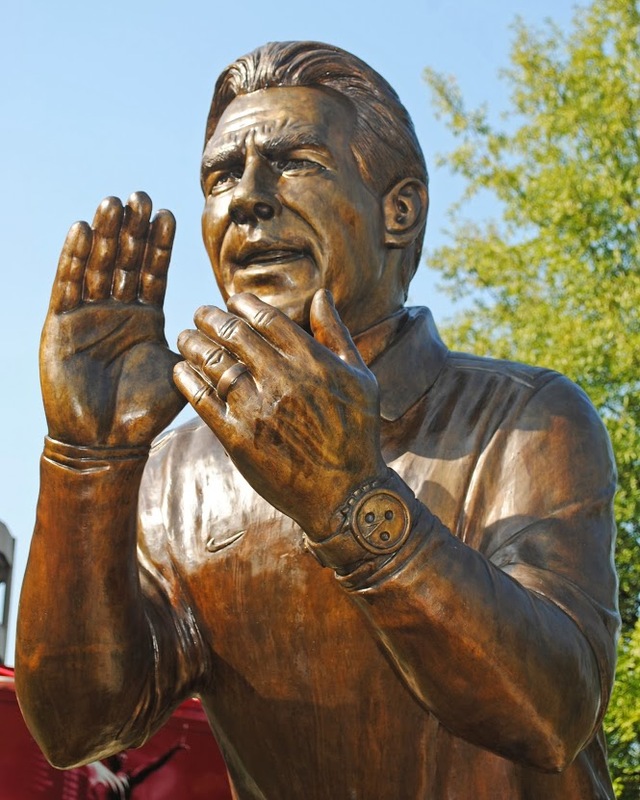 And it’s fitting that a $95 Fossil watch is shown so prominently as part of Nick Saban’s statue. It is what it is, nothing more and nothing less.